Participants in the Introduction to Skateboarding program at the Roundhouse. 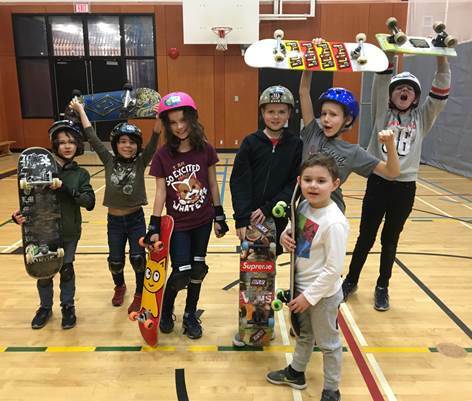 Our Community Youth Worker, Sally Chan, has been hard at work coordinating a variety of new programs for youth in 2019, including a partnership between the Roundhouse and UnderToe Skateboard Academy. The program provides fun, beginner skateboard lessons for youth ages 7-13, who want to learn the fundamentals of skateboarding, taught by experienced coaches, in a safe and supervised environment. UnderToe Founder and Head Coach, Jeff Cole, is a long-time skateboarder, community advocate, and instructor with over 15 years of experience working with youth. His programs offer extensive instruction for the beginners and first time riders learning to roll and push on flat ground, through to more advanced tricks and manoeuvres to use at the skateboard park. The Academy also offers programs at Mount Pleasant skate park in the summer, advanced skateboard lessons at the SBC’s 65 ft. long indoor skate-ramp, and private individual instruction. Indoor Beginner Skateboard Lessons at the Roundhouse continue through the winter with the next session running from Feb 14 to Mar 14, 2019. For more information check out undertoeskateboard.com or on social media at @undertoeskateboard.